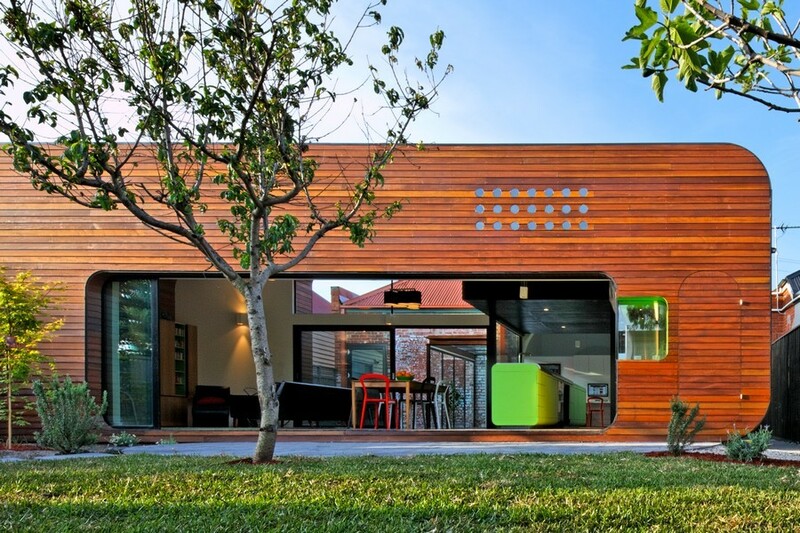 Programme and form are divided into three volumes, delineated by carefully inserted external courtyards. 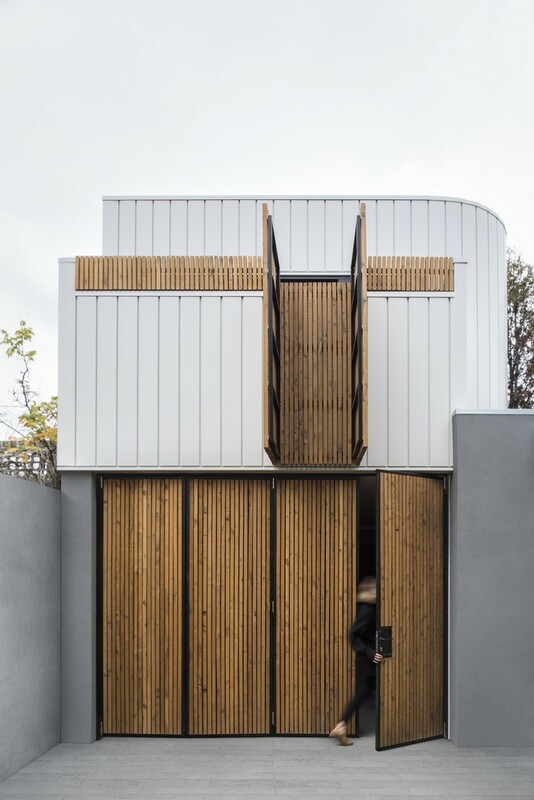 The first volume is given to autonomous ageing in place, the second to the primary living zones, and the third to a laneway accessed garage and loft studio. In the spirit of ‘Enfilade’, visual continuity throughout and between these volumes became the basis for resolving the client’s complex programmatic requirements while enhancing a sense of connectivity within the constraints of the narrow east-west oriented plot. Where space could not be afforded at the horizontal plane, axis and verticality are expressed through perforations in volumes connecting internal and external environments, extending programme, harnessing and diffusing northern light throughout. 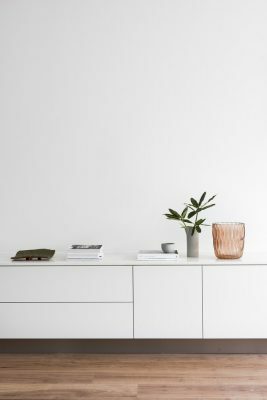 Form and material are expressed in light tones with softened edges minimising visual impact, mediating solar gain. Sympathetic to its context, speaking softly, yet proudly. 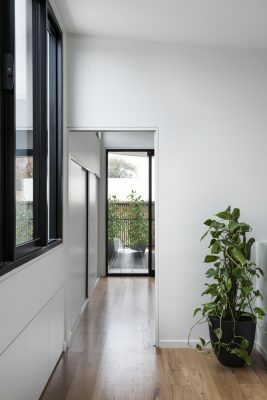 The most long-term aspects of the brief to the clients were the inclusion of ample natural light into the often cavernous downstairs areas of a double-storey terrace house; the avoidance of a cramped feeling within the narrowness of the site; and the delicate balance of seclusion/openness of the upstairs retreat. 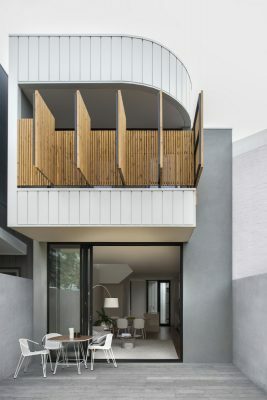 The brief for the Port Melbourne House included an exclusive upstairs retreat for the clients, offering privacy and seclusion from the busy world below yet offering extensive tangible connection with the outdoors, a challenge typical of the building typology of the terrace house in inner Melbourne. 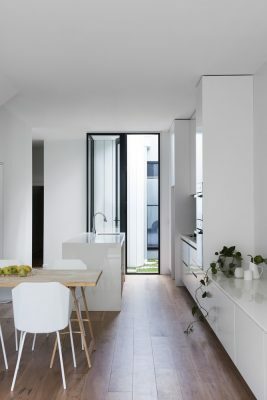 The downstairs programme was to include an open plan kitchen dining living area, along with living quarters for the clients’ elderly parent to age in place in the house with a careful balance of autonomy and assistance as required. At the rear of the property, accessed by an existing rear laneway, the clients requested a garage with home office loft to accommodate their academic work. 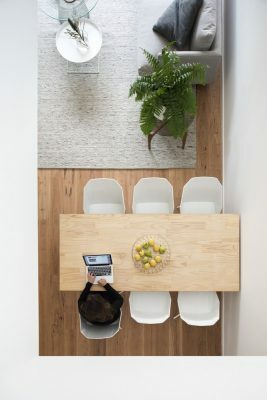 The material finishes are expressed in light yet warm tones, with timber composite flooring laid over in-slab hydronic heating providing superior thermal comfort in the living space and promoting a calm simplicity reflective of the clients’ native northern European design sensibility, and that of Winter Architecture. The gentle curves of the forms soften the edges of the volumes, minimizing visual impact on the sensitively placed neighbouring vantage points, and mediating solar gain to the internal spaces. The outcome is sympathetic to its context, speaking softly, yet proudly. The clients were a couple of full-time academics. 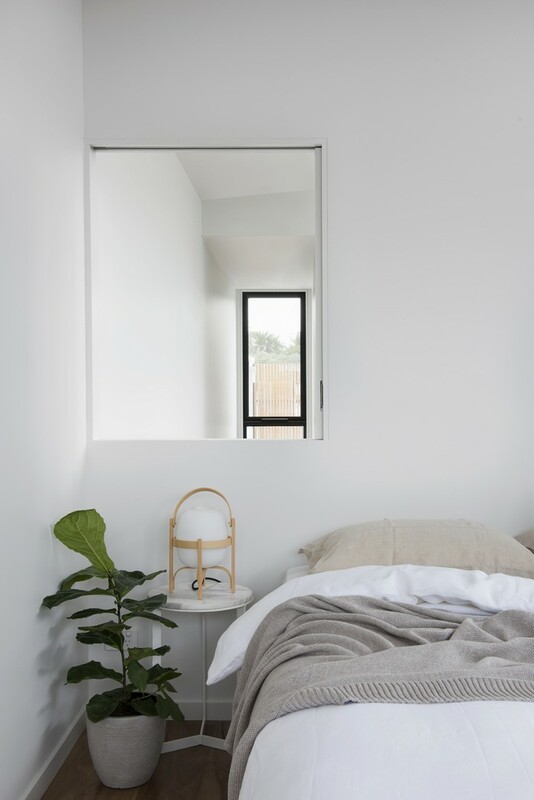 They had owned and leased the existing Victorian Era terrace house for several years with the intention of renovating as their future long-term home, to be closer to family in the area and to accommodate retirement plans in their desired inner-Melbourne bayside locale. 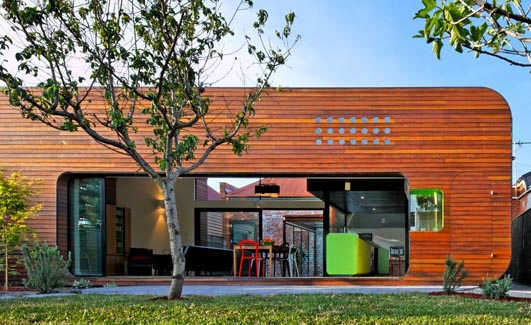 What are the physical elements of the project that the architect/designer has created to respond to that brief? 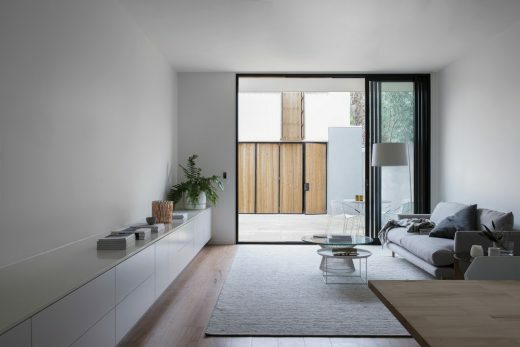 Programme and form are divided into three distinct volumes, delineated by carefully inserted external courtyards to allow natural light to infiltrate into the ground floor areas. 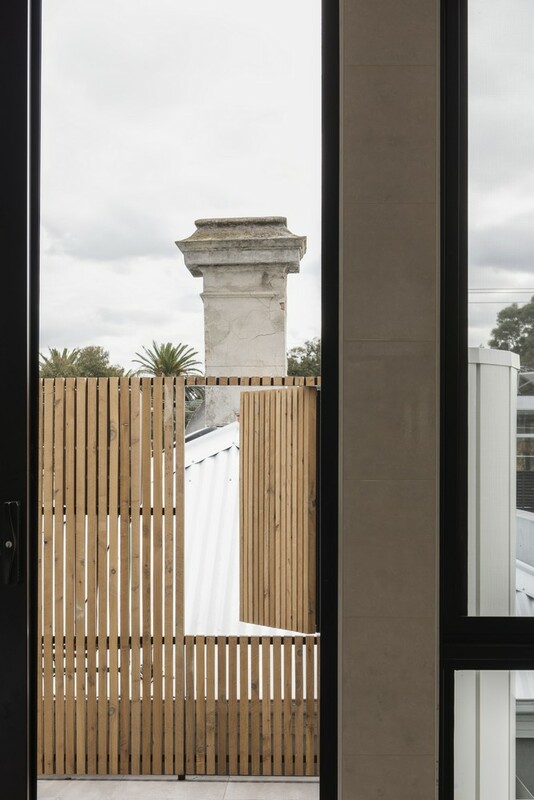 The first volume is contained within the front portion of the existing Victorian era terrace house and is given to ageing in place. 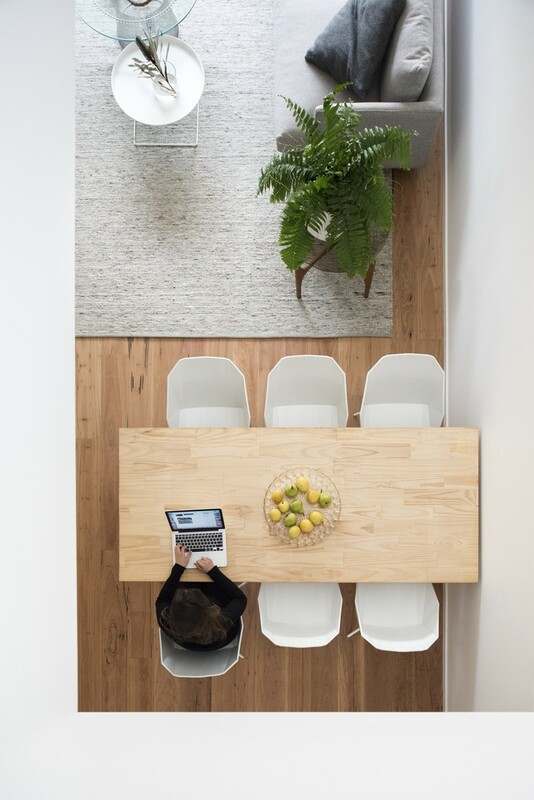 The second volume is given to the primary living zones on the ground floor and the clients’ retreat upstairs. The third volume is given to the garage and studio loft. In the spirit of ‘enfilade’, visual connectivity throughout and between these volumes became the basis for resolving the clients’ complex programmatic requirements while enhancing a sense of connectivity and space within the constraints of the narrow east-west oriented plot. 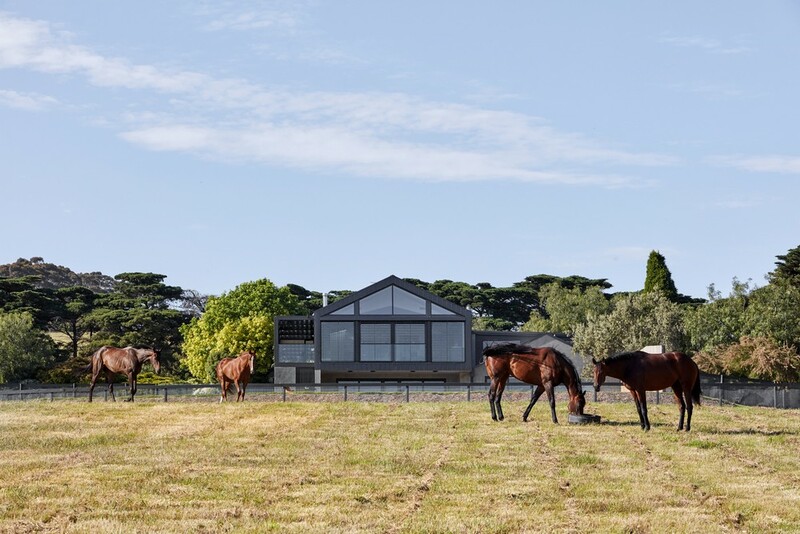 Expansive views through and between adjacent volumes are encouraged and directed via sliding peek-a-boo panels, timber batten privacy screens, and full height double glazing at the carefully inserted courtyards. Care was taken not to let the garage cause a sense of claustrophobic enclosure of the rear courtyard, with operable timber batten screens incorporated to allow for complete connection through to the laneway if so desired. 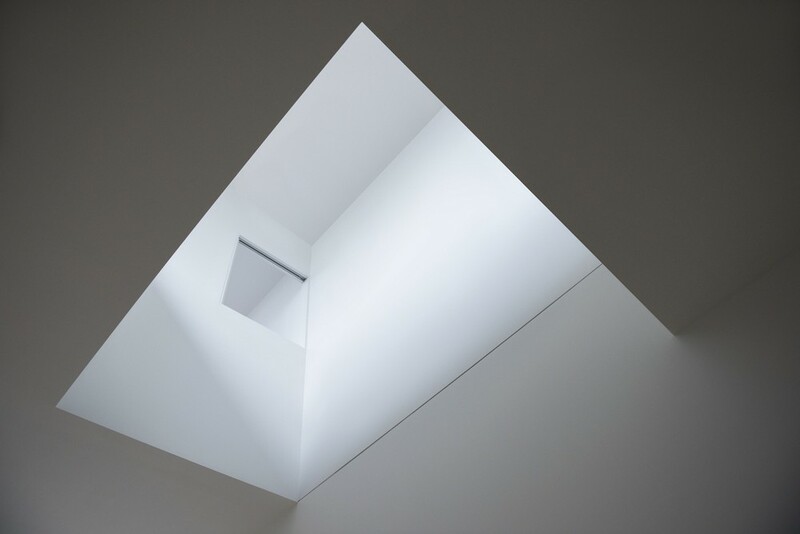 Where space could not be afforded at the horizontal plane, axis and verticality are expressed through double height voids, perforating volumes and connecting internal and external environments, harnessing and diffusing northern light throughout the ground floor areas. The external areas of the upstairs retreat are carefully screened to evoke a strong sense of connectivity to the outdoors from the bedroom and generous ensuite, whilst ensuring a sense of seclusion and privacy from the ground plane.